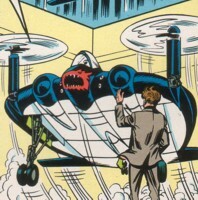 (Marvel Fanfare I#16) - On June 4th, 1940 Wolf, Johns and Levine were brought to the Lobo somewhere off the coast of Spain where they met with Matt Slade Jr. who told them about his million dollar prototype airplane that crashed somewhere in the Polish province of Boldavia. He told them that his son was the pilot and asked them to work together as a team to rescue him. Slade Jr. then showed them the final version of the plane his son had tested. After only three days of training, the Sky-Wolves started their rescue mission and flew to the Poland. There they landed in a destroyed city to ask a resident about Matt Slade III's whereabouts, and he told them that he was held beneath Murder Mountain. Suddenly the Flying Führer arrived, but they couldn't be taken out and a short time later they attacked the Flying Führer. They realized that it hung from a dirigible and after the Sky-Wolves destroyed it, the Flying Führer fell to Earth. (Marvel Fanfare I#16/2) - On June 10th, 1940 the Sky-Wolves continued their way to Murder Mountain, but they were soon stopped by a field of Sky-Mines. Wolf shot one Sky-Mine to learn what it was and told the others to avoid these things. Steel Kommando attacked them and hit one of Johns' rotors. Johns stumbled into a Sky-Mine and crashed. Levine started a new plan against Steel Kommando and used a trick he learned in Hollywood as a special effects man. He used projectors to seemingly transform his Flapjack into a dragon. The Steel Kommando fell for the trick and Wolf used the distraction to ricochet Sky-Mines with his rotors into other Sky-Mines until one hit and destroyed the Steel Kommando. Wolf and Levine then landed at Murder Mountain and shot their way through Nazi soldiers. They reached Slade's cell and opened it only to find Slade pulling a gun against them. (Marvel Fanfare I#17) - Wolf convinced Slade that they were hired by his father to rescue him, and Slade went with them, but not without his new flame Gretchyn Skul. Again they had to shoot their way through soldiers that had found the Flapjacks. Surprisingly, Johns, whom they had believed dead, returned and helped them. They all returned to Lobo II and had a good nights sleep. While everyone was asleep, Skyler Wolf followed Gretchyn Skul and revealed her as a traitor. When she didn't tell them anything, Matt Slade Jr. asked the Sky-Wolves to fly again. On June 11th the Sky-Wolves flew to the French coast where Murder Mountain was already waiting for them. Levine again used his projectors to create hundreds of Flapjacks and the Nazis couldn't get a fix on a real target. The Sky-Wolves shot a hole into Murder Mountain and entered it. They killed all soldiers they met inside and after General Skul was killed, they destroyed Murder Mountain's engine and it blew up. The Sky-Wolves then returned victorious to the Lobo, where Wolf, Levine, and Johns got their rewards. But they didn't want to leave and stayed on the Lobo to fight alongside Matt Slade III as the Sky-Wolves in World War II. Comments: Created by Marv Wolfman, Dave Cockrum & Joe Sinnott. Somebody screwed up time in this story. It started on June 4th then it was stated that the team started after three weeks training to their rescue mission in Poland, but they were already there on June 10th to free Matt Slade III and destroyed Murder Mountain on June 11th. Let us just pretend that they started their mission three days after meeting Matt Slade Jr. and not three weeks and everything is fine. Sidney E. Levine (second from left; top picture) aka. The Gaffer went on to become a scientist for SHIELD and designed the majority of Nick Fury's equipment. His history was too much for a sub-profile (I don't own any other appearances of him), but probably he will be covered at some point in the future. OK. The sliding timescale will cause some problems with this story eventually. It's about 20 years later now. Could the Gaffer have been in WWII? Probably, but while he would have been @ 65 years old when the story came out, he'd be 85+ years old now, and getting older all of the time. His involvement in this story will become progressively unlikely; it will have to have been his father OR else he will have to have some age suppression factor. Maybe he, too, got a blood transfusion from Fury? 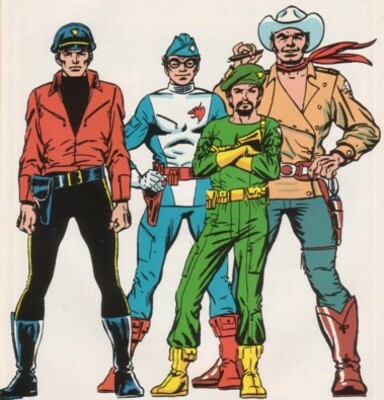 Matt Slade III's grandfather was none other than the western hero Matt Slade first seen in Matt Slade, Gunfighter#1 (May, 1956). This story occurred before America entered World War II between the 4th to the 11th of June, 1940. It was mentioned again and again in the story. 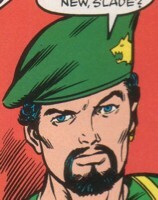 All Sky-Wolves wore that nifty wolf-logo seen below on Little John's beret somewhere on their outfit. This short-run series reminded me of the old "G-8 and his Battle Aces" pulp magazine stories from the 1930's, which featured a first World War aviator and his flying team going against zombies, death rays, assorted monsters and weirdies. 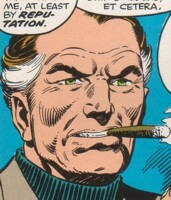 Skywolf - see JOHN JAMESON, alias first used in Captain America I#3__? He was a natural leader and one of the best test pilots in the United States. He was able to fly any kind of plane and was specially trained in flying the Flapjack. In addition, he knew how to use a machine gun. 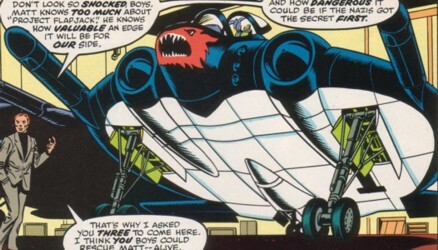 (Marvel Fanfare I#16) - Test pilot Skyler Wolf was brought to a meeting with Matt Slade Jr. on the submarine Lobo II. He was asked to rescue Matt Slade III with his new partners. After three days training with the Flapjacks he flew with his partners to Poland, landed in a destroyed village and learned the whereabouts of Matt Slade III after asking a resident. After an attack by the Flying Führer, he freed Levine from debris with Johns' help because he didn't want to lose anybody on their first mission. He then flew up to the Flying Führer to find out the truth about this thing and destroyed it with his colleagues. (Marvel Fanfare I#16/2) - Skyler flew towards Murder Mountain, but Sky-Mines blocked his teams' way. Skyler blew one Sky-Mine up to see what these flying things were and told his men to avoid them. When Steel Kommando attacked, Skyler used Levine's distraction to ricochet with his rotors Sky-Mines into other Sky-Mines until one hit and destroyed the Steel Kommando. 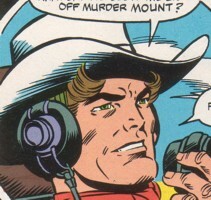 Together with Levine he landed at Murder Mountain and shot his way through to Slade's cell. (Marvel Fanfare I#17) - Wolf convinced Slade that they were hired by his father to save him. He led everyone back to the Flapjacks and they returned to the Lobo. At night Skyler followed Gretchyn and revealed her as a traitor. Skyler captured Gretchyn, but she kept quiet about her father's plan. Skyler flew with his team against Murder Mountain and they destroyed it. After that Skyler returned to the Lobo took his ten thousand dollar reward, but he didn't leave with it and stayed on board to continue fighting in World War II with the other Sky-Wolves. He was the best escape artist in the world in 1940. 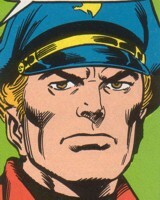 He always had several escape-artist tools hidden in his beret. He was trained in flying the Flapjack and knew how to use a machine gun. 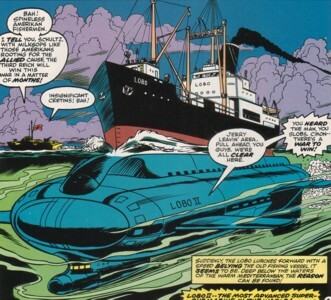 (Marvel Fanfare I#16) - Johns was brought to a meeting with Matt Slade Jr. on the submarine Lobo II. After three days training he flew with his new partners to Poland. He helped Levine to get out of his plane when they first landed by opening it with his escape-artist tools. After an attack by the Flying Führer he wanted to retreat, but Skyler asked him to help him save Levine first. After that he joined the other Sky-Wolves and destroyed the Flying Führer with them. (Marvel Fanfare I#16/2) - Little John flew with the Sky-Wolves to Murder Mountain, but they had to avoid Sky-Mines. Little John's rotor was hit by the Steel Kommando and his Flapjack stumbled into a Sky-Mine which exploded. Johns crashed and seemingly died. (Marvel Fanfare I#17) - Johns returned with his Flapjack to help his team mates escape from Murder Mountain. He returned with the others to the Lobo and had a good night's sleep. After Gretchyn was revealed as a traitor he once again flew with the Sky-Wolves. They reached Murder Mountain and a short time later Johns and the Sky-Wolves destroyed it. Johns returned to the Lobo, took his ten thousand dollar reward and stayed with the other Sky-Wolves to fight alongside them in World War II. He was a test pilot for his father (Matt Slade, Jr.)'s corporation and was specially trained in flying the Flapjack. He was also able to fly other planes and knew how to use a machine gun. He liked to dress like a cowboy to remember his grandfather (Matt Slade, Sr.). (Marvel Fanfare I#16 (fb) ) - Matt tested a Flapjack prototype and crashed somewhere in the Polish province Boldavia when a washer blew. There he was captured by Nazis and brought to Murder Mountain. (Marvel Fanfare I#16) - General Skul interrogated Matt about the prototype he flew, but Matt kept quiet and was taken back to his cell. (Marvel Fanfare I#16/2) - Gretchyn Skul visited Matt in his cell and brought him a meal. He agreed to take her with him when she told him that she wanted to help him escape. When Levine and Wolf entered his cell Matt believed them to be Nazis that tried to trick him and threatened to kill them. (Marvel Fanfare I#17) - Convinced by Wolf's story Matt went with the Sky-Wolves and took Gretchyn with him. He returned with the Sky-Wolves to the Lobo and was happy to see his father again. He slept at night while Gretchyn was caught by Skyler when she contacted her father General Skul. The next day Matt joined the Sky-Wolves on their attack against Murder Mountain. He shot General Skul and then destroyed Murder Mountain with the Sky-Wolves. He returned to the Lobo and decided to fight with the other Sky-Wolves in World War II. He was the owner of the Slade corporations and responsible for the invention of some of the most sophisticated technologies of his time. (Marvel Fanfare I#16 (fb) - BTS) - Matt sent his son out for a test flight for the Flapjack prototype. After his son had crashed Matt formed a plan to return him. (Marvel Fanfare I#16) - He brought Wolf, Levine and Johns together as a team. He told them why he needed them and gave them the Flying Flapjacks to do their job. (Marvel Fanfare I#17) - He welcomed his son and the Sky-Wolves back on the Lobo. After Gretchyn Skul was revealed as a traitor he asked the Sky-Wolves to stop General Skul. Matt Slade Jr. was shot by Gretchyn on her escape, but she only wounded his arm. After the Sky-Wolves' returned he gave them their rewards. He was happy when they wanted to stay to fight in World War II. They were a million dollar project by Slade Aircraft. Matt Slade III crashed with the first prototype in Poland. It was a combination of a jet and a helicopter. It possessed hidden rotors especially needed as a device for vertical take off and landing. It also possessed six machine guns right next to the cockpit and two launchers for missiles next to them. Normally at least three weeks training was needed to know how to control a Flapjack, but the Sky-Wolves learned it in around three days. Each plane possessed a unique number. Flapjacks 1 through 5 were seen in action. Flapjack#1 was commanded by Skyler Wolf, Flapjack#2 by Sidney E. Levine, Flapjack#3 by Jesse Johns, Flapjack#4 by Matt Slade III and Flapjack#5 (stolen) by Gretchyn Skul. On Levine's Flapjack, in addition to the weapons, a holographic projector was built in for him. It was a specially invented combo of ship and submarine created by Slade Ship-Builders. Beneath the fishing vessel Lobo was the submarine Lobo II which served as Slade's secret HQ. The ship enabled him to enter hostile waters whenever he wanted to. The Nazis never saw through the disguise and Lobo II stayed a secret. Inside Lobo II the Flapjacks, several hundred men and weapons were hidden. The Flapjack's could takeoff vertically through a moveable platform in the fishing vessel.